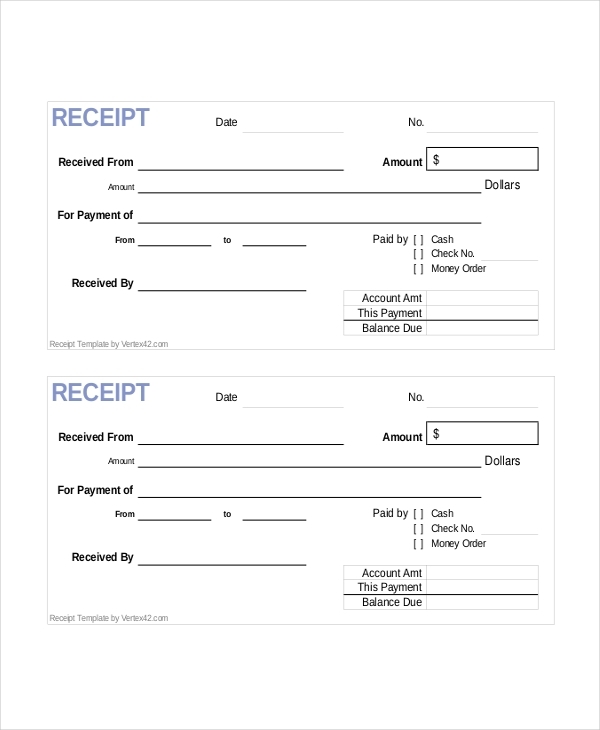 Cash receipt forms are documents which prove that the amount of any transaction was real. The transaction does not require any other proof than the cash receipt. Both the buyer and the seller need to keep a copy of the cash receipt form so that they can prove the reality of the transaction. The cash receipt forms are the legal evidence of any kind of transactions. Usually, the business owners provide the customers and clients with the cash receipt forms. A blank cash receipt form has the sections which consist of the details of the buyer and the seller. The receipt is very useful for both the provider and the receiver. Blank supplemental receipt forms come into action when an individual loses or damages the original receipt for any expenditure. 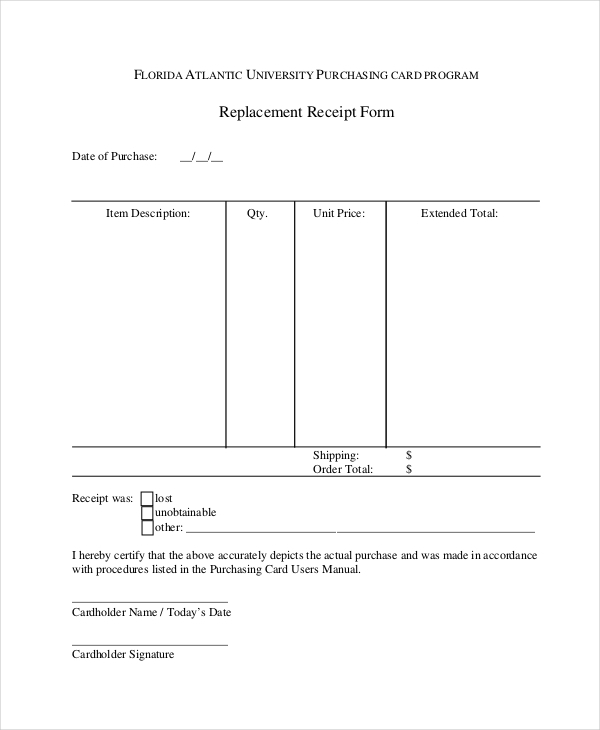 The receiver of the receipt has to fill out and submit the supplemental receipt forms to the supplier. The receiver of the receipt has to mention all through amounts representing the original costs which were mentioned in the original receipt, in the supplemental receipt form. The applicant has to fill out all the fields of the form before signing and submitting it. Free blank printable receipts are very useful. Actually, these receipts are designed in a way so that any company and business owner can use these. The blank receipts are easily printable and usable. These receipts contain fields such as the date of the purchase, the amount of the purchase, the receipt no, the name of the person who has received the money, the mode of the payment. 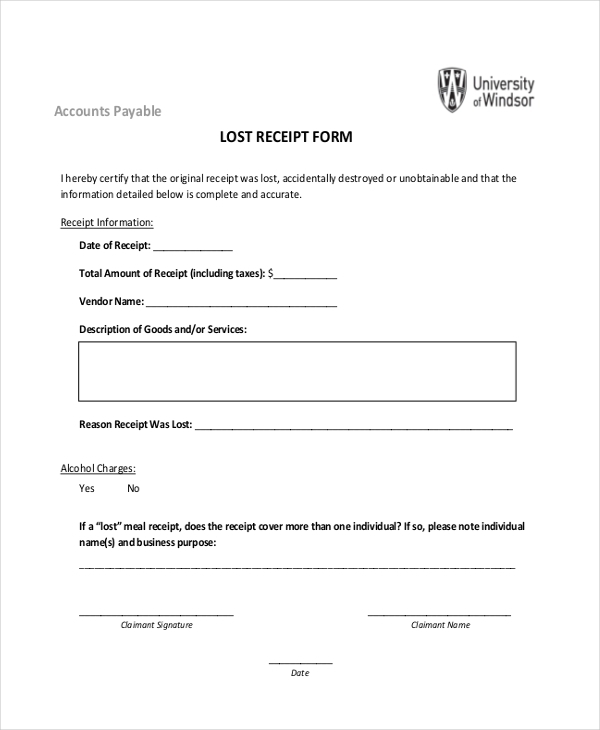 Blank missing receipt forms are used while requesting payment from the university which is not supported by the original receipts or any other documents. The form is not needed for miscellaneous expenses. 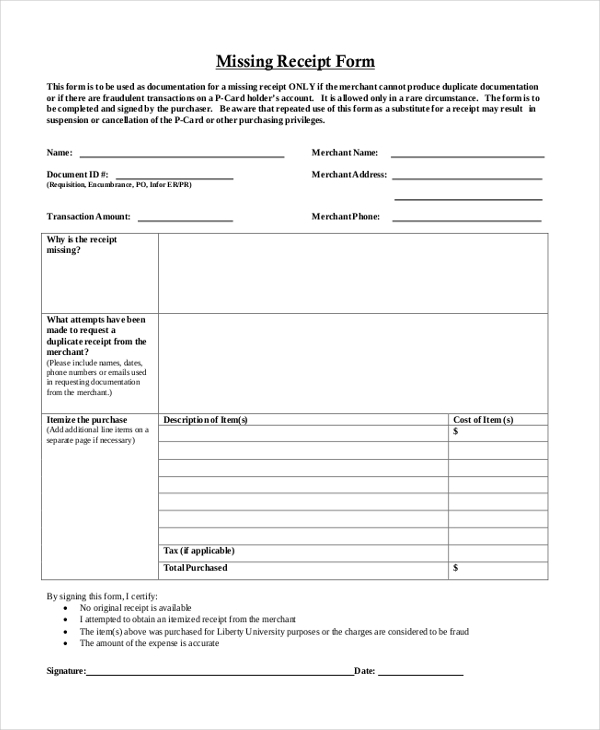 The form can be used for requesting inadequate or missing documentation. 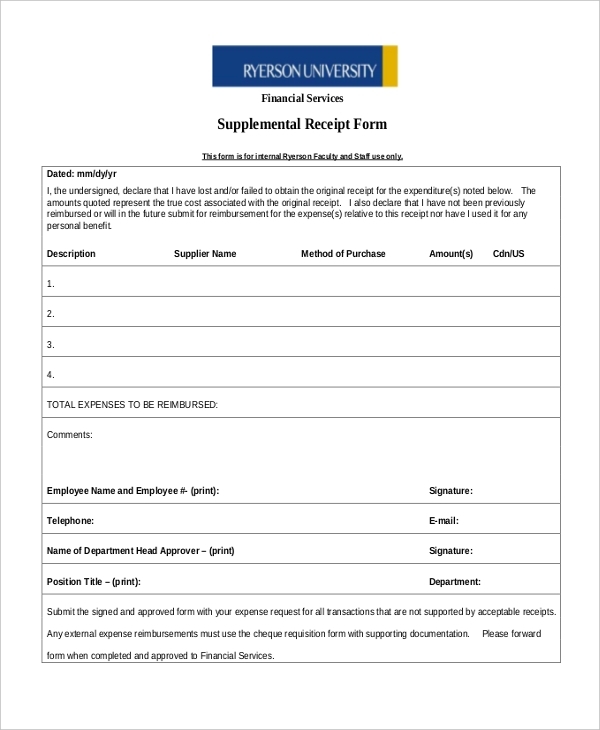 You need to refer to the expense reimbursement policy of the university while filling out the form. The form contains fields such as the name of the applicant, the name of his/her school and specific department, the telephone number of the applicant and so on. The applicant needs to read out the form well before filling it out. Blank replacement receipt form comes to use if anyone has lost the original bill. The applicant needs to submit the form to get another copy of the original copy. The applicant has to provide all the details of the original purchase. He/she has to mention the date of the purchase, the amount of the transaction, the reason of making the request to obtain a new receipt and so on. The applicant has to provide all the information which is real. As these forms are legal documents, one cannot provide false information via these forms. The cardholder has to sign the form after filling it out. Lost receipt forms are used when anyone loses the original bill of any purchase. Many blank formats of such lost receipt forms are available on the internet. You can easily download such receipts whenever you need to. By filling out the form you actually certify the fact that you have lost the original receipt, or you have accidentally destroyed the receipt. You need to provide all the true information which is accurate. Since this is a legal document, you cannot take the risk of providing false information. Mention the date of the purchase, the accurate amount of the deal, the name of the vendor and so on. Blank ticket receipt forms are used to claim for any payment or debts which are supposed to be collected by the state of Michigan. The forms are used in accordance with the state laws. These forms are used to file a claim for the lottery prize of the state of Michigan. The applicant has to sign and submit the ticket of the lottery along with filling out and submitting the blank ticket receipt form. 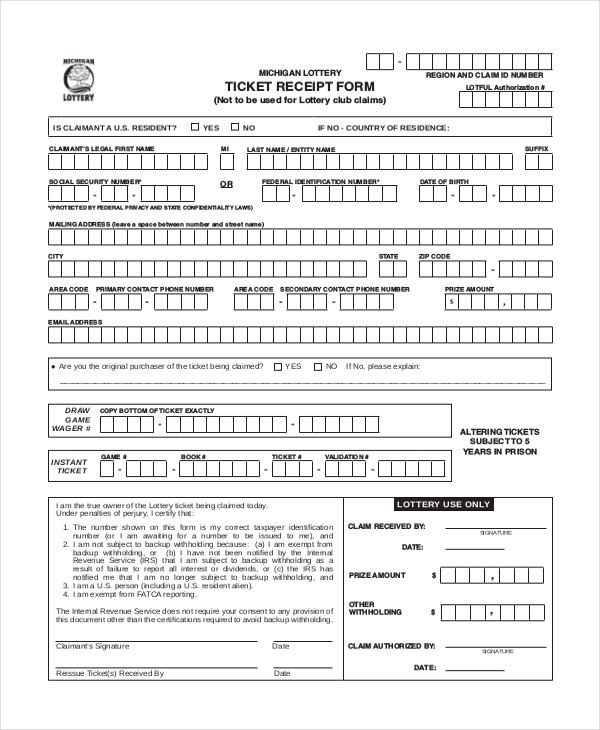 The blank prize receipt form is filled up by an individual who wants to claim the amount of the prize which he/she has received by winning any event. The applicant needs to read out the form well before signing and submitting it. 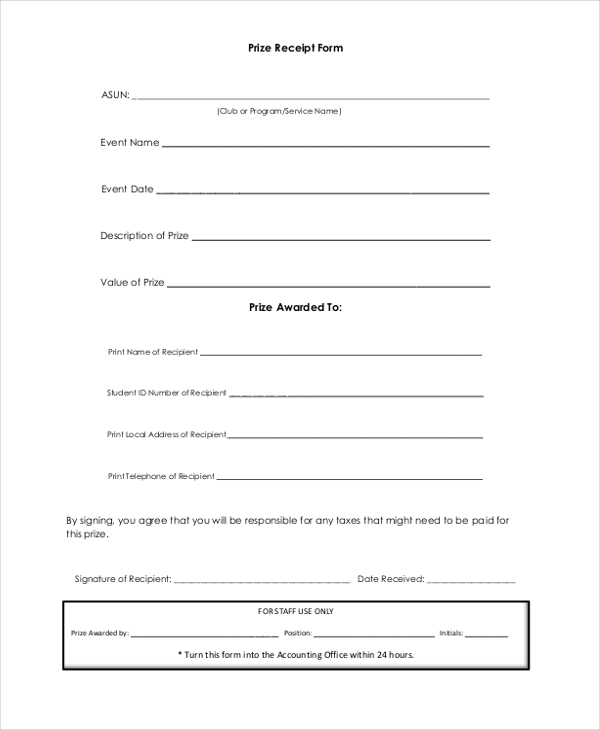 The form contains various fields such as the name of the prize, the amount of the prize money, the date of the event, the name of the event, the description of the prize, the value of the prize, the name of the recipient, his/her address (both local and residential), his/her telephone number and so on. The applicant has to submit the form to the accounting office within twenty-four hours of taking the form from the office. 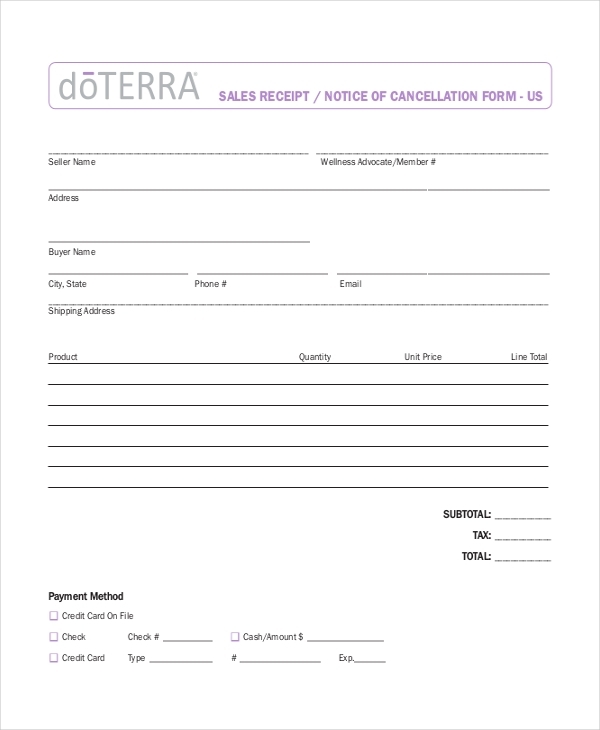 The sales receipt form is also known as the notice of the cancellation form in the United States. The sales receipt form contains the name of the seller, the address of the seller, the name of the buyer, the address of the buyer, the details of the purchased product, quantity, the actual price, and the details of the payment mode and so on. The applicant also has to mention the tax amount (if any), while filling out the form. The applicant needs to submit the form to the accounting office after signing it. Apart from all these, the retailers also need to include all the details of the tax and other added costs in the receipt. But the bonuses and tips which are given by the buyer don’t need to be included in the authentic receipt. How to Generate a Receipt? Generally, a receipt is processed under the supervision of a salesman. The salesman knows all the real data which is required to make the receipt. The salesman needs to prove all the information included in the receipt are real, to the customers. The main component of the receipt is the total amount of the items that are being sold or purchased. The customers do have the rights to ask whether the price is real or not. The salesman has to prove that the price is real. After receiving the payment from the customer, the seller has to provide the customer with the receipt of the specific items. The seller also keeps a copy of the receipt in order to track the deal. If you are a salesman and you are looking for the blank receipt form, you do not need to worry much. You do not have to look for the formats of these forms in the market like the earlier days. You are a part of the digital era. 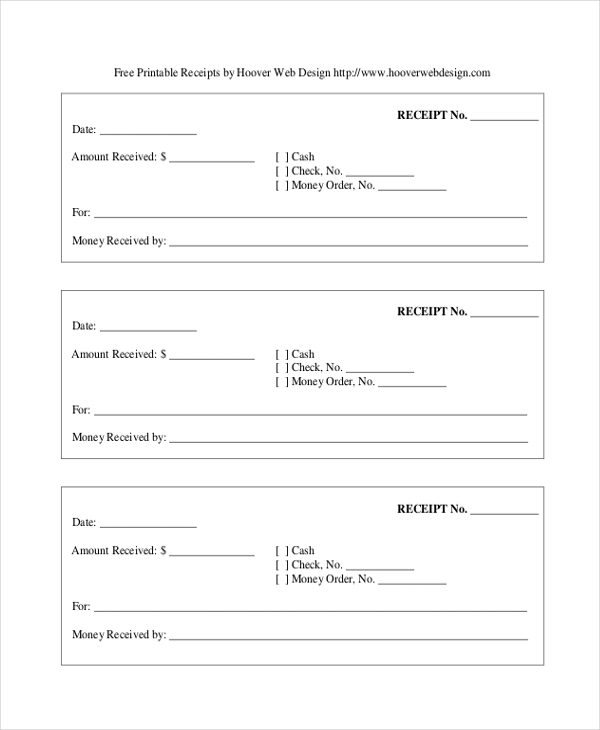 You can easily download such blank receipt forms from the web whenever you need to do so. The forms come in low resolution so these do not require much memory space. You can get the forms both in PDF or word document. You can easily download the forms for free. You can even edit and modify the forms as per your need.